On the Events in Ottawa Today. Cpl. Nathan Cirillo was shot and killed in Ottawa today. When I saw the news breaking this morning the details were very limited. One thing was clear. A reservist standing guard at the National War Memorial had been shot. There were pictures of him receiving medical attention. One picture in particular of a woman giving him mouth to mouth while others performed chest compressions stirred some emotions in me that I was really not prepared for. I thought This was a follower of Islam, again. This time they have gone too far. We need to get them. But get who? It was only minutes later that the reports starting rolling in that the gunman was dead. Probably exactly as he has planned. At this point it was not even clear who the shooter was or what his motivations were. Reporters were making the link to Islam as they kept talking about the radicalized convert that had killed a soldier in Quebec two days ago. Always insinuating the link, never saying it outright. I started to think of how people would react if it was a radicalized Muslim versus just a crazy person with a gun. As if it made a difference. And now 8 hours later I am still angry but I even with this small passage of time I have been able to take some time to reflect. I used to live near Parliament Hill and would visit often; the security presence was visible but very subtle. According to the National Post the first 911 calls came in at 9:52am. There are images coming out of the suspect on the ground, likely dead, at 9:56am. Four minutes. If there is a positive we can pull from today it is the professional and efficient response of the parliamentary security, RCMP and Ottawa City Police. They maintain a open, public space with effective , non-intrusive security. They do a great job. Now comes the hard part for many Canadians. We need to figure out if anything could have prevented this, see what went wrong in the reaction and improve it. What we do not need is to lock down all public spaces with heavily armed security guards. The systems we have in place have been effective up to this point. Should we be on the lookout for more attacks on soldiers? Of course we should. But we do ourselves no good asking to live in a police state fueled by fear. To anyone that says that parliament needs to be locked down from now on please understand that that the War Memorial is not on Parliament Hill, it is outside the surrounding fence, across a public street. 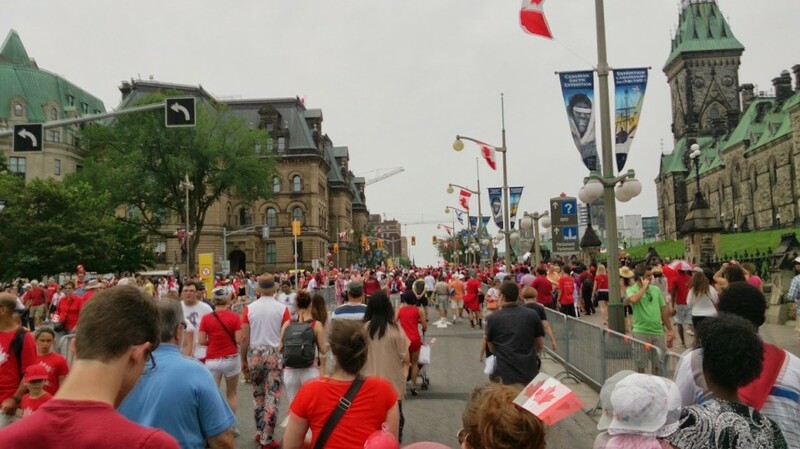 The only way more security would have prevented this death is if the entire downtown core of Ottawa was made a secure area with both vehicle and personal searches of everyone entering the zone. That is an Ottawa that I do not want. Here is an image I took on Canada Day two years ago. The steps to the War memorial are about 20m away; just off camera to the left. That building on the right is the East Block on Parliament Hill. This is the Ottawa I know. My initial desire for revenge, fire and brimstone have calmed. Canadians should take a moment to think about how we fit into this dangerous world. Think about how we want our government to react. We should not be out for blood. Do I think that the world’s problems can be solved without ever using military force? No, I don’t think anyone is that naive. But I also do not think that instantly reacting to the natural human desire for revenge will solve things in the long run. Today has been a rough for Canada I hope tomorrow we wake up resolved, confident and alert but overall, not much different from an average Thursday. We must resist the urge to awake fearful, angry and bloodthirsty because that would certainly make us less Canadian than when we opened our eyes this morning.